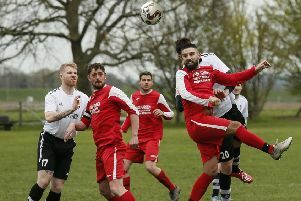 Ampthill Town bounced back from their heaviest home defeat of the campaign to record their second away win of the year with a 2-1 triumph at Stotfold on Tuesday night. Town showed plenty of resilience in coming from a goal down at the break to earn their first away win since November. Both sides carved out early openings, with Daniel Olinarav having a shot blocked for Town and Deane Dummett also missing a half chance. It was Roker Park side Stotfold who went ahead in the 25th minute when Mark Ellis fired an angled shot into the net for 1-0. Despite this set-back, Ampthill rallied and Dummett went close to forcing an equaliser after a embarking on a good run just before the break. Town goalkeeper Lewis Jarman-Webb had to be at his best in the second half and he pulled off some fine stops to keep his side in the match. However, Ampthill were a stronger unit in the second period and they levelled the scores at 1-1 when Daniel Olanirav got the decisive touch after a Dummett free-kick was headed in his direction. Soon afterwards, Jarman-Webb pulled off another great save to keep Town level, and that was to prove important as his side went ahead when Danny Butler sent a 20-yard rocket of a shot flying in past the home keeper. Town defended valiantly for the remainder of the game, and Dummett and Charlie Cullen both worked hard as the visitors secured a vital away win. Derwayne Stupple’s side head to Berkhamsted on Saturday, before a crucial week when they host Holmer Green on Tuesday night and visit London Tigers the following Saturday. Ampthill currently sit 20th in the SSML Premier Division table.